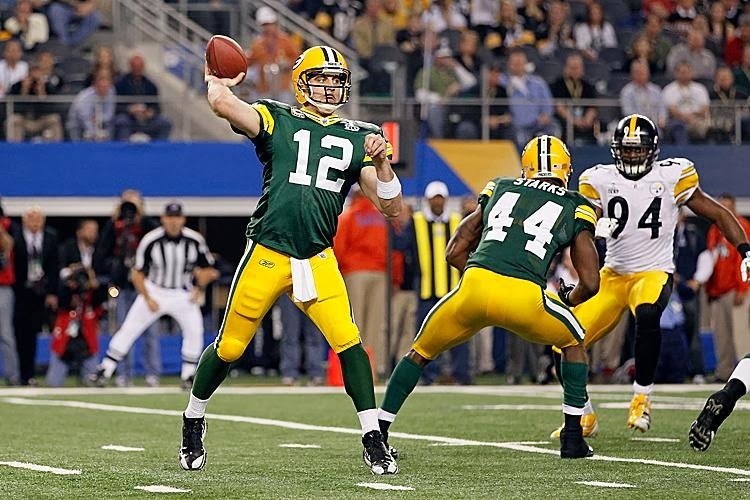 Super Bowl XLV on February 6, 2011 pitted the team that had won the most NFL titles, the Green Bay Packers with 12, against the Pittsburgh Steelers, the club that had won six Super Bowls, the most since that annual showcase had come into existence. The Packers, who overcame a rash of injuries throughout the season, were the sixth seed in the NFC coming into the playoffs. Having started out the 2010 season at 3-3, they won five of their next six games and finished second in the NFC North at 10-6. QB Aaron Rodgers (pictured above), the successor to Brett Favre as starting quarterback, suffered two concussions but also came into his own in a year in which he led the NFL in passing with a 101.2 rating. Pro Bowl WR Greg Jennings was the most productive of a good receiving corps (76 catches, 1265 yards, 12 TDs) while WR Jordy Nelson was coming on in the postseason. The running game had been a chronic problem after RB Ryan Grant suffered a season-ending injury in the opening game, but RB James Starks was a pleasant surprise in the playoffs. The defense featured a solid group of linebackers led by OLB Clay Matthews. Head Coach Mike McCarthy’s team went on the road in the postseason and defeated the Eagles in the Wild Card round, ambushed the top-seeded Falcons in Atlanta, and then bested the long-time rival Bears for the NFC title. Pittsburgh, under Head Coach Mike Tomlin for the fourth year, topped the AFC North at 12-4 despite not having QB Ben Roethlisberger for the first four games due to a suspension for violating the NFL’s personal conduct policy. The Steelers were 3-1 without him and when Roethlisberger returned, he played well. Wide receivers Mike Wallace and Hines Ward were productive while RB Rashard Mendenhall rushed for 1273 yards and 13 TDs. The Steelers ranked second in the league in total defense, and the unit was solid throughout. Pittsburgh defeated the division-rival Ravens and Jets to reach the Super Bowl. Wintry weather had been a problem in the week leading up to the contest, but clear skies and milder temperatures returned on game day. There were 103,219 fans in attendance at Cowboys Stadium in Arlington, Texas, with many more watching the telecast. The teams exchanged punts until midway through the first quarter, when the Packers put together a nine-play, 79-yard scoring drive. James Starks ran for eight yards on a third-and-one play and Aaron Rodgers completed three passes to Jordy Nelson, the third of which was good for a 29-yard touchdown. Mason Crosby added the extra point. An illegal block on the ensuing kickoff had the Steelers starting at their seven yard line, and on the next play Ben Roethlisberger threw long and was intercepted by FS Nick Collins, who returned it 37 yards for a TD. Crosby’s conversion put Green Bay up by 14-0. The Steelers came back with a 13-play drive that extended into the second quarter and was helped along by Roethlisberger scrambling for 18 yards on a third-and-nine play and passing to WR Emmanuel Sanders for the necessary 13 yards in a third down situation to the Green Bay 22. The drive finally stalled at the 15 and Shaun Suisham kicked a 33-yard field goal to get the AFC Champs on the board. The Packers went three-and-out on their next series and Pittsburgh moved to midfield before Roethlisberger again was picked off, this time by DB Jarrett Bush, giving the Packers the ball at their own 47. It took Green Bay just four plays to make the most of the turnover. Rodgers completed passes to Greg Jennings for four yards and then Nelson for 16 before Starks ran for 12 yards to the Pittsburgh 21. From there, Rodgers again connected with Jennings down the middle (pictured below), this time for a touchdown and, with Crosby’s PAT, a 21-3 lead. Down by 18 points and getting the ball back on offense with 2:24 left in the first half, the Steelers advanced 77 yards in seven plays. Roethlisberger started off with a throw to WR Antwaan Randle El that picked up 37 yards to the Green Bay 40. Another Roethlisberger pass was knocked down at the line of scrimmage, but he completed his next four tosses, three of which were to the 34-year-old veteran Hines Ward. The last completion to Ward was good for a six-yard touchdown and, following Suisham’s extra point, the score was 21-10 at halftime. The Packers had the first possession of the third quarter and punted, with a face mask penalty on the return giving Pittsburgh favorable field position at the 50. Rashard Mendenhall ran for 17 yards on first down and, following a short running play, Roethlisberger gained six yards on a scramble that set up third-and-one. RB Isaac Redman gained 16 yards around end and Mendenhall capped the five-play series with an eight-yard touchdown carry. Suisham added the extra point and the Steelers were behind by just four points and appeared to have the momentum. The Packers had another short possession followed by a punt, and the Steelers, starting at their 40, again moved into Green Bay territory. Roethlisberger threw to Ward for a 15-yard gain to the 29, but the Packers stiffened on defense and, following a third-down sack of Roethlisberger, Suisham was wide on a 52-yard field goal attempt. The teams exchanged punts for the remainder of the period but, on the first play of the fourth quarter, Mendenhall fumbled, which was forced by Clay Matthews, and LB Desmond Bishop recovered for the Packers at the Green Bay 38. Two pass completions were followed by two that fell incomplete, but facing third-and-10, Rodgers connected with Nelson for 38 yards to the Pittsburgh two. Rodgers was sacked by LB LaMarr Woodley for a loss of six yards on first down but followed up with an eight-yard scoring pass to Jennings. With the successful conversion, the Packers held a widened lead of 28-17. The Steelers responded with a 66-yard drive in seven plays. All of those plays were Roethlisberger passes, and he completed six of them, including the last to Mike Wallace for 25 yards and a TD (pictured below). Pittsburgh then went for a two-point conversion and it was successful when Randle-El took a pitchout and reached the end zone. Green Bay’s lead was narrowed to three points at 28-25. The Packers started their next possession at their 25 with 7:34 left to play. Rodgers was sacked on first down by DE Ziggy Hood but threw to Nelson for nine yards and, after a false start backed them up five yards, Rodgers went deep to Nelson for a gain of 31 yards to the Pittsburgh 44. Starks ran twice for a total of 15 yards before Rodgers went long for WR James Jones and picked up 21 yards to the eight yard line. The Steelers held on defense, but Crosby added a crucial 23-yard field goal to make it a six-point game. With the clock now down to just over two minutes, the Steelers had one last shot. Starting at their 13, Roethlisberger threw to TE Heath Miller for 15 yards and Ward for five, but the next three passes fell incomplete and with that Green Bay came away with a 31-25 win. The Steelers led in total yards (387 to 338) and first downs (19 to 15). They also recorded three sacks, to one by Green Bay. However, Pittsburgh also turned the ball over three times, to no turnovers by the Packers. Aaron Rodgers, the game’s MVP, completed 24 of 39 passes for 304 yards and three touchdowns with no interceptions. Jordy Nelson had 9 catches for 140 yards and a TD while Greg Jennings scored twice while pulling in four receptions for 64 yards. The Packers didn’t run the ball much, and James Starks led the club with 52 yards on 11 carries. For the Steelers, Ben Roethlisberger was successful on 25 of 40 throws for 263 yards with two TDs, but also two interceptions, and ran for 31 yards on four attempts. Mike Wallace was the top receiver with 9 catches for 89 yards and a touchdown and Hines Ward contributed 7 receptions for 78 yards that also included a score. Rashard Mendenhall rushed for 63 yards and a TD on 14 carries. It was the 13th league championship for the Packers, and they appeared on their way to another when they went 15-1 in 2011. However, they fell flat in a loss to the Giants at the Divisional playoff level to snuff out their hopes of repeating. Pittsburgh again went 12-4, finishing second in the AFC North, but lost in stunning fashion to the Denver Broncos in overtime of their Wild Card playoff contest.